Proto5533 presents After Alexandria, the Flood with Jorge Mendez Blake, Ekin Bernay, Eşref Yıldırım, Meriç Algün Ringborg, and Sultan Burcu Demir, curated by Naz Cuguoğlu, which explores how the knowledge gets organized, controlled and absorbed in the current information overload of digital and non-digital libraries. Humanity once dreamed of reaching the skies with the Tower of Babel, it once dreamed of owning all the knowledge in the universe with the Alexandria Library, and now we live in the internet age, completely surrounded by information, seemingly limitless and infinite. 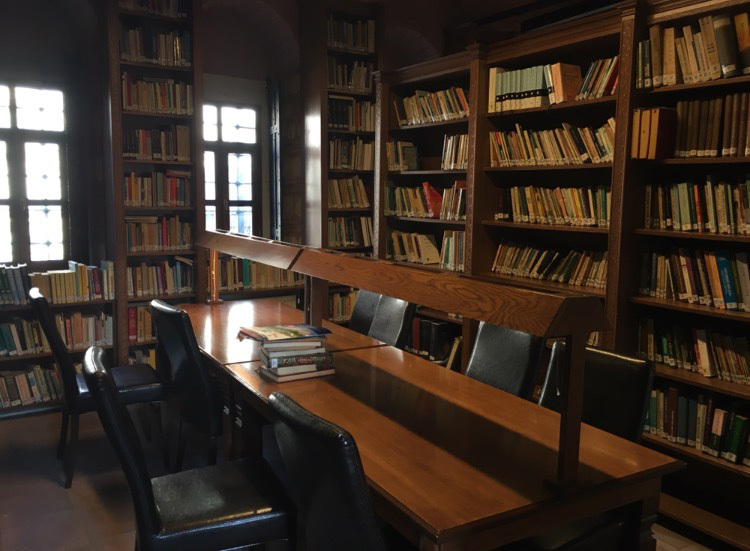 Today information appears so limitless and chaotic that we begin to wonder who holds the power to control it, how do we navigate and make choices among the glut of information that is available in digital or non-digital libraries? Inspired by Jorge Luis Borges’s short story “Library of Babel” (1941) and its resemblance to internet with its shadowy architecture and infinite hexagons, this exhibition looks for an answer. Exhibited at Proto5533, Blake’s work “The Borges Library” consists of a mural resembling books and mirrors, inviting the audience to experience the feeling of Borges’s infinite library. Ringborg’s video titled “A World of Blind Chance”, is a play, composed by found sentences from the Oxford English Dictionary, showing an actor who is rehearsing a monologue and whose movements are directed, questioning the control mechanisms and hierarchies of knowledge. Yıldırım’s work “Tweetrary of Babel” deals with the difficulty in trusting the accuracy of data and the ownership of the information control by inviting the audience to contribute to a Twitter feed with autocomplete feature, a manifestation of infinite information flow. Presented at Recai Mehmed Efendi Library, Demir’s “Index” installation consists of paper-cut globes, creating “text-forms” that present content physically impossible to read while creating a visual library in reference to Borges’s “library-universe” and questioning the hierarchical presentation of libraries and the boundaries of information accessibility. Bernay’s performance invites the audience on a performative journey, taking different routes through library books, questioning interpretation of stories using human inventions like language in a world where the information is under control and writing exists for its own sake. The catalogue titled “After Alexandria, the Flood” accompanies the exhibition and brings together texts about the works in the exhibition. Selected Curators: Naz Cuguoğlu, Kevser Güler, Mehmet Kahraman, Ghaith Mofeed, Nicole O'Rourke, Ilhan Ozan, Ulya Soley. Mentor Curators: Celenk Bafra, Curator, Istanbul Modern, Istanbul; Anne Ellegood, Senior Curator, Hammer Museum, Los Angeles; Övül Durmusoğlu, Independent Curator Berlin/Istanbul; Anthony Huberman, Chief Curator, Wattis ICA, San Francisco; November Paynter, Associate Director of Research and Programs, SALT; Yasmil Raymond, Associate Curator, Museum of Modern Art, New York; Mari Spirito, Director, Protocinema, Istanbul/New York; François Quintin, Director Fondation d'entreprise Galeries Lafayette, Paris.